Brining a turkey before roasting it results in a juicy, tender bird. Unless you go overboard on the salt, or leave the turkey in the brine too long, you needn’t worry about it tasting too salty. You do need to plan ahead -- the turkey must be thawed or fresh, and the brining process takes at least 8 hours. You also need room in your fridge for the pot you brine the turkey in, or an alternative method to keep it cold as it soaks. 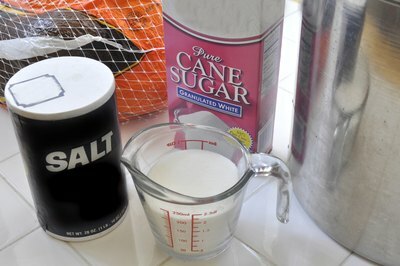 Combine water with kosher salt in a proportion of about 8 to 1, or 2 gallons of water to 4 cups of salt. 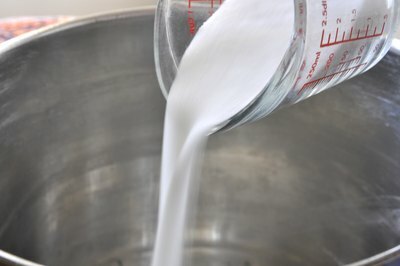 Add a full cup of sugar if you use 2 gallons of water. Otherwise, adjust the proportion of sugar accordingly. Stir until the salt and sugar dissolve. Add fresh herbs, if desired. Place the turkey in the brine, breast side down. Cover and place it in the refrigerator, or in a cooler with enough ice packs to keep the temperature below 40 degrees Fahrenheit. Leave the turkey undisturbed for about 8 hours. Take the turkey out of the brine and discard the liquid. Rinse the bird inside and out, and pat it dry. Set it in a roasting pan and return it to the refrigerator overnight to dry out the skin. Remember to remove the giblet pack from the turkey’s cavity before brining.